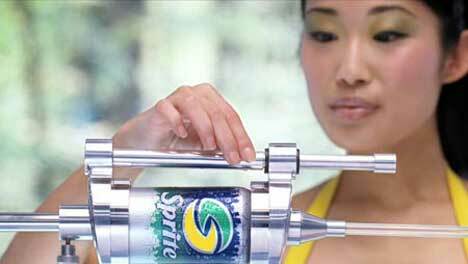 Coca Cola’s Sprite brand has been relaunched in the United States with a television and web campaign called ‘Sublymonal Advertising’. Welcome to Sublymonal Advertising. Don’t Worry. It will only affect your brain. This is the world of the Sublymonal Spa, Sumo, Defibrillator, Greenhouse, introduced to the world through the Lost series. A man lying in a health resort is clad in clear plastic, with slices of lemon and lime covering his eyes. A nurse administers a tube that drips a mixture of lemon and lime juices into his mouth. As she leaves the tube moves so that the juice is now falling onto his eye. He flips a slice off his face to reveal a mouth eagerly slurping up the lemon/lime juice. Two sumo wrestlers run through a dark forest, one green (Lime) and one yellow (Lemon). In the middle of the forest a blue-tuxedo-wearing man suddenly appears sitting on a stump. As the two wrestlers come close to each other the shot includes two Volkswagen Beetles (yellow and green) racing towards each other with a sea in the background. The man is rapturously caught in their collision, his mind filled with lemon and lime imagery. A woman lies at the top of a flight of stone steps, exhausted, her red formal dress spread out around her. A miniature emergency van drives up. Two women step out and charge their defibrillator with lemon and lime. A voice intones, “Embedding Lymon”. They apply the paddles to her lips and to her tongue, sparking off a flurry of lemon and lime images in her mind. She awakes, totally refreshed. A worker in a hydroponics greenhouse waters his flowers with liquid from a Sublymonal backpack, distributing a mixture of green and yellow nutrients. As he waters each plant the syllables sub, lym, on and al are released by the flowers. The soundtrack is called ‘Time of the Season’, an a capella remix of the original performed by The Zombies. Download the track from iTunes. Two 60 second Sublymonal films were made, one for cinema, one for television. Shots from the three 30 second ads are spliced in with another story in which a hydroponics worker discovers the power of lemon and lime juice on his plants. A samurai warrior slices lemons and limes suspended in the air. The online Sublymonal campaign was first introduced through a website dedicated to fans of the television series, Lost. Advertisements for a fictional company, Hanso Foundation, began to introduce subtle references to the emerging Sublymonal campaign. Viewers were referred to www.sublymonal.com, at which they were able to engage in clues relating to the television series. Over time the site morphed into a clearly-evolved advertising site promoting the new-look Sublymonal Sprite brand. Visitors to the Sublymonal site are invited to enter passwords to interact with media-saturated screens. Key words are ‘Gulp’, ‘Belly’, ‘Chill’, “Defib”, “Pulse”, “Listen”, “108”, “Kicks”, “Spray”, “Belly”, “Bentley”, “Embed”, “Scan”, “Tongue”, and, no doubt many others. Other words bring up a narrated excerpt from Wikpedia’s dictionary. Visitors to the site are referred to the Lymonade videos at YouTube, auctions at Ebay, profiles of musicians such as Talib Kweli and Fonzworth Bentley. Try “Sprite”, “Good”, “Lymon”, “Love”, and “Heir Apparent”. The Sublymonal campaign was developed at Crispin Porter + Bogusky, Miami, by chief creative officer Alex Bogusky, creative director Tim Roper, copywriters Rob Strasberg and Franklin Tipton, art directors Geordie Stephens and James Dawson-Hollis, and senior agency producer Chris Moore. Filming was shot by directing collective Happy via Smuggler with director of photography Martin Ruhe, executive producers Patrick Milling Smith and Brian Carmody, producers Jeff Miller and Allison Kunzman, and line producer David J. Bernstein. Spotwelders editors were Haines Hall and Damion Clayton. Visual effects were developed at Framestore New York. Music was arranged by Walter Werzowa at Musikvergnuegen. The Sublymonal web site was developed by AKQA, San Francisco.